I translated another track from this series previously. This track takes the references to the next level – it makes it tough to translate, because so much more meaning can be gained from what you hear, rather than from what you read. Realistically, every line could use a translation note! I was lucky enough to find a blog post in Japanese that outlines a lot of the references. I’ve placed the list at the bottom of the translation – see if you can hear them all! It was a Japanese summer: the schoolgirl detective’s summer. kanda saijaku tantei-san konnan dou? iru to omou? Scoundrel! Storm clouds gathered on Baker Street. The tools of the trade were headed for the pawnshop. They say a detective was dropped into the evil alley’s well—like that, another was bumped off. Near the brightly decorated street, Arisugawa, is Yokomizu cleaning Edokawa? So, weakest detective in Kanda, what do you think? Do they exist? Lord have mercy. I tread on the steps, and my brain is a locked room. Rock, scissors, who matches? We’ll use it to group them into wise and foolish people. Train tricks, fire tricks, and accidents. Don’t talk nonsense to me! That’s that. Dot com. Accha cha cha cha! Paris, Paris. That’s that. Dot com. Accha cha cha cha! Donshari, donshari. Everybody has no alibi, no alibi! kouboku ni futari unno hara sakaguchu angou mushi shitarou? etc Reichenbach. The raven cries. The attendant was stabbed, pay kind attention. They say the phantom thieves await at the window of the former school building with smiles all stitched up. Two people are in a tall tree. The sea field. Did they ignore Sakaguchi’s code? Is it ABC or Ebisu? “How are the lemons?” Be serious! The plaintiff hides the defendant. Like that, surrender. Thanks, forensics! Let’s try rounding up – where did the five dead people go? They stop and give up when faced with this strange incident. and more… the professor’s (author’s) teasing comes every time. 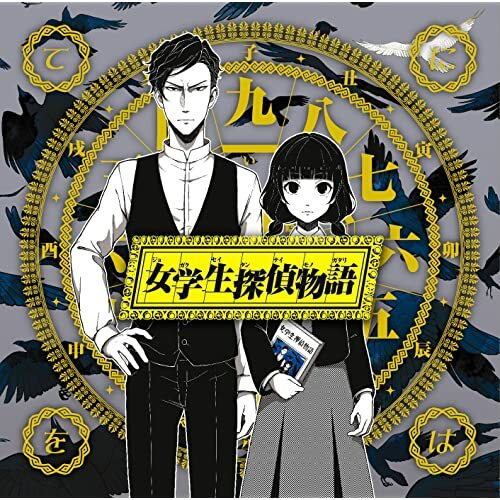 Plunged into the phantom thief alliance’s trap, the great detectives disappeared one by one. And, while the detectives were away, people’s hearts became locked rooms. and more… the professor’s teasing is so wicked. The professor is a mystery writer. Scary or cute? When I divulge the tricks, you may enter. (1) 花紋 (kamon) literally means ‘flower pattern’, but has likely been used to represent the English phrase ‘come on’. I’m not sure exactly what the mystery is this time? For this song, I kind of get the feeling that Hibari may be exaggerating or dramatizing the case. She is a fan of the mystery genre, after all. Maybe the author names are aliases for actual police or PI detectives who are being murdered. I wonder what time period this series is set in. Is there anything else noteworthy in the blog post? Thanks for alerting me to the copying error – it’s all fixed now. I made some changes to the previous section and copied it to that section, which is why the quote wasn’t updated. As for the time period, it gives me strong Taisho/Showa-era Japan vibes, but it also has some modern influences. It feels slightly… anachronistic in that sense? Kind of like Hibari is a modern girl, but she visits a bunch of old towns for the cases. It mentions that the girls with Japanese characters on their faces are three sisters, who we see in other videos in the series. The posts mainly focus on spotting the references, rather than working out the plot of the song.